I do love a challenge. Specially if it involves food as you’ll know if you follow Scarlet Bennett’s creative challenge. This week a challenge popped up on my twitter feed courtesy of Sam Linsell. This particular challenge, #FoodBankRecipe, involved not only food but a cause dear to my heart, and there was a prize of two business class tickets to London involved. The challenge went like this: buy a recipe from FoodBank SA for R40, cook the dish, tweet a picture of the dish to #FoodBankRecipe. Ever since I first read A Girl Called Jack’s blog and googled ‘food bank south africa’ I have wanted to do some sort of fund raising project with FoodBank South Africa as a recipient. I haven’t got round to it. How terrible to be ‘too busy’ to make the effort. What I had in mind and what I still plan to do one of these days is a store cupboard supper. I thought I’d invite a whole lot of people, say ten to twelve, to supper asking them to bring two items languishing on their more-likely-than-not overfilled pantry shelves. I would cook a supper then and there using all their contributions as well as a couple of judiciously chosen items from my pantry. Every participant would donate R40 to FoodBank South Africa. We’d have a lovely dinner party without spending obscene amounts of money AND we’d feed someone for a year. Maybe we’d do it once a month. Who’s available next week? Anyway, feeling a little bad that I hadn’t actually pulled off my store cupboard supper, I immediately bought the four recipes from FoodBank SA. Trouble was, I only had three days in which to cook the dishes – but I thought, what the hell, let me give it a bash. I dashed out and bought the ingredients – or should I say, some of the ingredients. I decided that where possible I’d use what I had on hand in the garden, and in my pantry. 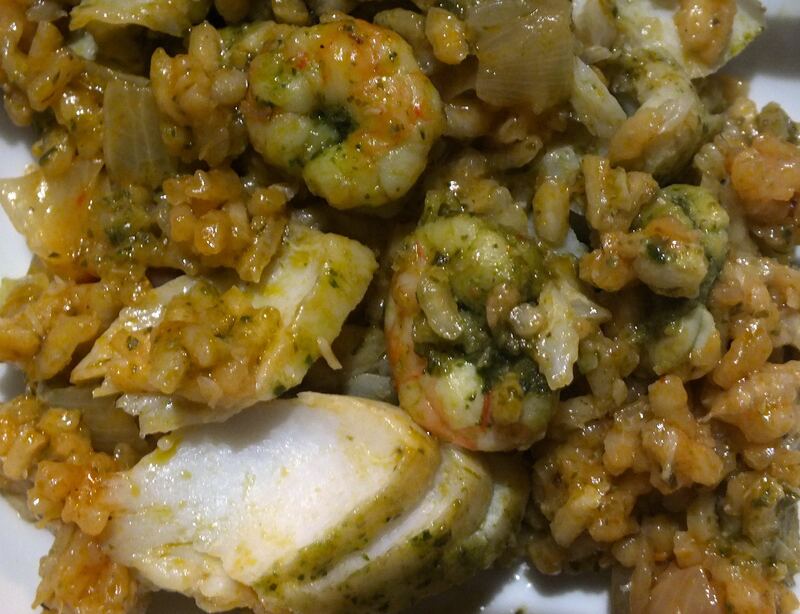 So, first up was Dominic Pain’s very easy non-stirred seafood risotto. I didn’t use her suggested kingklip, prawn, mussel and calamari but just hake and prawns. I doubled the quantities and we had eight servings from it, some for supper the day I made it and the rest reheated today for lunch. I’d definitely make this again – and in a hurry, too. with Cauliflower Tabbouleh recipe. I made double the recipe (again) simply because I wanted to use up the carrots and tamarind we had. I made a few other changes and used preserved ginger and picked garlic instead of fresh since we had them. Today I made the rest of Ishay’s recipe – the chicken breasts and tabbouleh. I used some of the excess tamarind chutney in a mint and tamarind chutney raita. Fabulous. The tamarind chutney and the cauliflower tabbouleh will be staples in our household now. Although certain people in this household claim not to be following the Banting diet, they were very pleased with this recipe. We will, however, be undoing all the Banting benefits by serving the left-over chicken and tamarind chutney with J’Something’s potato, pea and onion curry tomorrow. I have no doubt it will be a delicious combination. P.S. Peter Goffe-Wood, I’ve roasted your garlic and will be making your Angelfish with Grilled Asparagus and Roasted Garlic and Parsley Dressing too. Click here to make a donation to FoodBank SA.